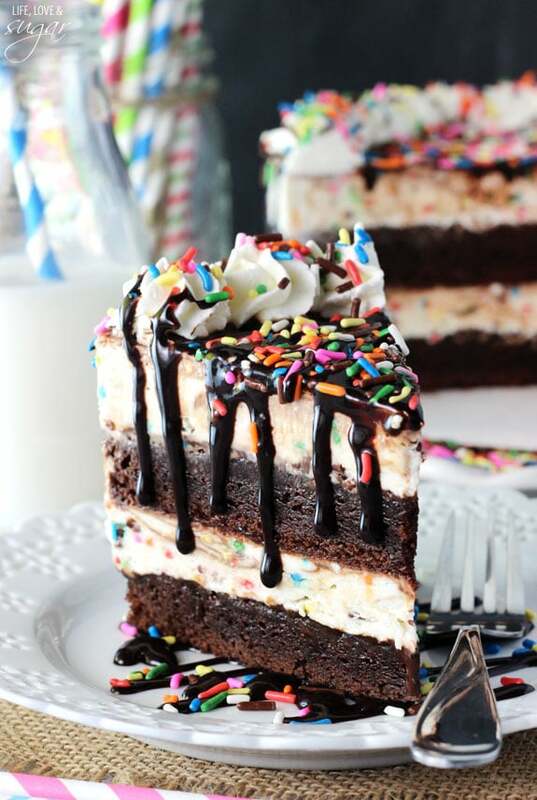 This Cake Batter Fudge Brownie Ice Cream Cake combines many of my favorite things – funfetti cake batter, brownies, fudge sauce and ice cream! It’s a wonderful combination of flavor and textures and it should definitely be on your must make list! So the hubs and I contacted a fence company about installing a fence for Jessie back near the beginning of December. We’d hoped to have it installed by Christmas, when we had 5 dogs staying at our house, but it didn’t happen. They were definitely on the slow side and we’ve had a fair amount of rain over the last few weeks. Well when we left for Miami last Friday, they’d still only put the fence posts up. We’ve been really ready for it to be done so that we can stop thinking about it and let Jessie use it. She’s had an electric fence since we got her, but she’s kind of gotten used to the fact that she can get out. We’ve left the collar off a few times we she got out and she now assumes she can come and go. So before we’d even left, we started wondering and hoping that we’d arrive home to a finished fence. On Monday, it came up about 100 billion times as we got ready to fly home. We even decided to place bets on whether it was done or not. Of course then the hubs got nervous about if he’d win or not. Next thing I knew, he was telling me that if we both were wrong (I said it’d be done, he said they’d done more work but it still wasn’t done) and they’d done nothing else, that it meant we both would get the things we bet for. We proceeded to argue about how betting works. Correct me if I’m wrong, but if both people lose, don’t they both lose out on what they bet for? As in nobody wins, so nobody gets a prize? I’m quite sure I’m right, but it was fun to argue. It didn’t matter anyways, because he won fair and square. They’d done more work, but not finished. However, they came yesterday and after more than a month, it’s finally done! YAY! Now we have to wait 30 days and the hubs gets to stain the wood. I am interested in this cake however. Especially eating it. If you’ve made any of my other ice cream cakes (and there are many), then you know that they aren’t hard, but there are a few steps. I start out with a box brownie mix. You could make your own from scratch, but I choose not to complicate things. I get the box that’s big enough for a 9×13 pan, since you’ll need two 8 inch brownies. The bigger the box, the better really. More brownie could never be a bad thing. Once the brownies are made and cooled (and there are some notes below about the pan you use to bake them – important notes), you’ll make the ice cream. One of the things I love about the ice cream recipe is that it doesn’t use an ice cream machine. It’s great for a number of reasons. 1. It’s so easy and there’s no waiting for the ice cream to freeze before you can add it to the cake. It’s thick on it’s own and great for layering with the brownies. 2. Despite being oh-so-easy, it’s also delicious and nobody ever knows that it’s not store-bought or traditionally made. I’ve had people ask before about the cream cheese, and trust me, you don’t even taste it. Once the ice cream is made, everything is layered together and frozen. It’s really quite simple. I like to line my pan with some clear wrap (I use the the new Saran Wrap Press and Seal because it’s thick and strong) and use that to lift the frozen cake out of my pan when it’s ready. Then I add more chocolate sauce, whipped cream and sprinkles. Of course, if you have a springform pan, that works even better and eliminates the need for the clear wrap. There’s more about that in the notes for the recipe. I love the smooth, creamy cake batter ice cream paired with the chewy brownies. 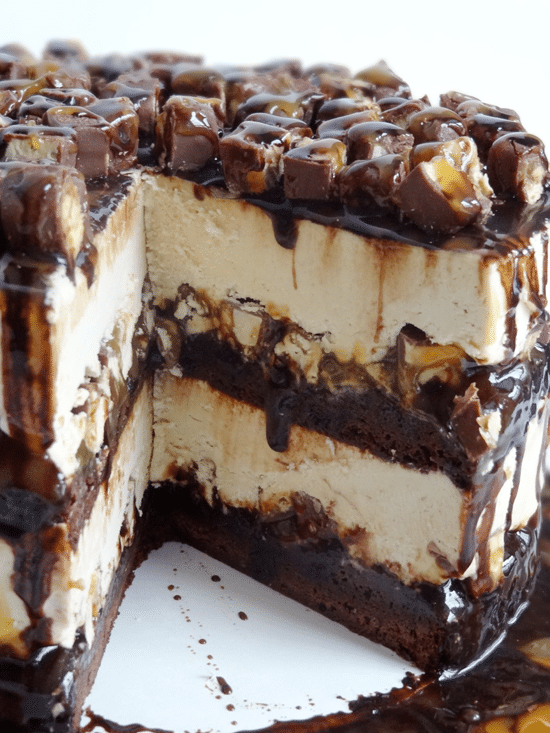 I’ve always loved brownies in my ice cream, so I absolutely love it as layers in an ice cream cake. And of course I’m obsessed with cake batter. 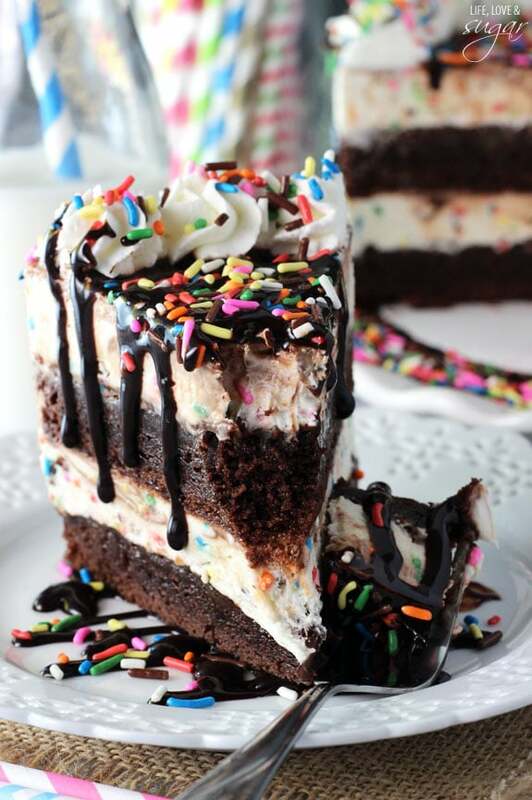 This Cake Batter Fudge Brownie Ice Cream Cake is definitely my new fave! 1. Make brownie batter according to instructions on back of box. 2. Grease two 8-inch pans (preferably springform pans, see above) and line the bottoms with parchment paper to allow for easy removal. Bake at temperature on box, reducing baking time to about 20 minutes. 1. Once the cake has cooled, make the ice cream. Beat cream cheese until smooth. 2. Add sugar, milk and cake mix to cream cheese and mix until completely combined. Mixture will be thick and sticky. 3. Fold in the cool whip and sprinkles. Mixture will be thick. 3. Spread 1/4 cup of hot fudge sauce on top of the brownie. 4. Add half of the ice cream and spread into an even layer. 5. Drizzle 2 tbsp of hot fudge over ice cream and gently work it into the ice cream to create a little of a swirl. 6. Add second brownie to the pan. 7. Spread 1/4 cup of hot fudge sauce on top of the brownie. 8. Top with remaining ice cream. 9. Add remaining 2 tbsp of hot fudge and gently work it into the ice cream to create a little swirl. 10. 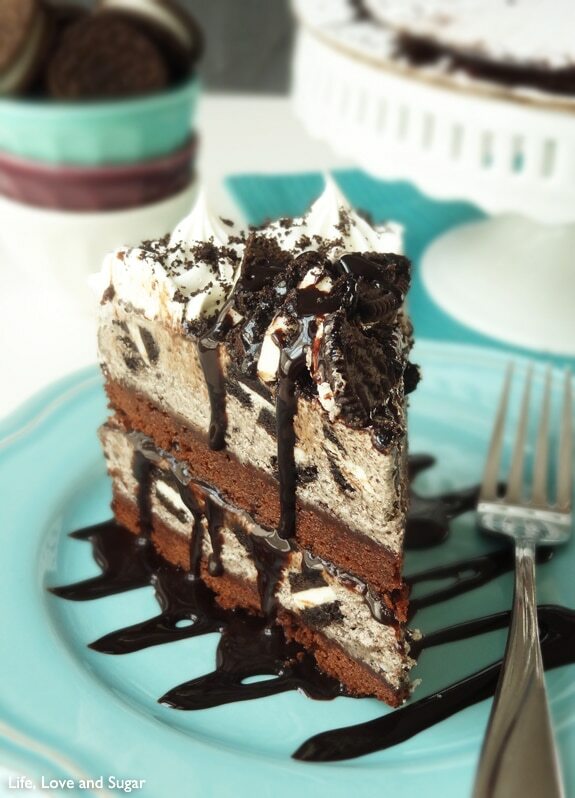 Allow ice cream cake to freeze completely, 6-8 hours. 11. When frozen, remove from springform pan and remove parchment paper from sides. 12. 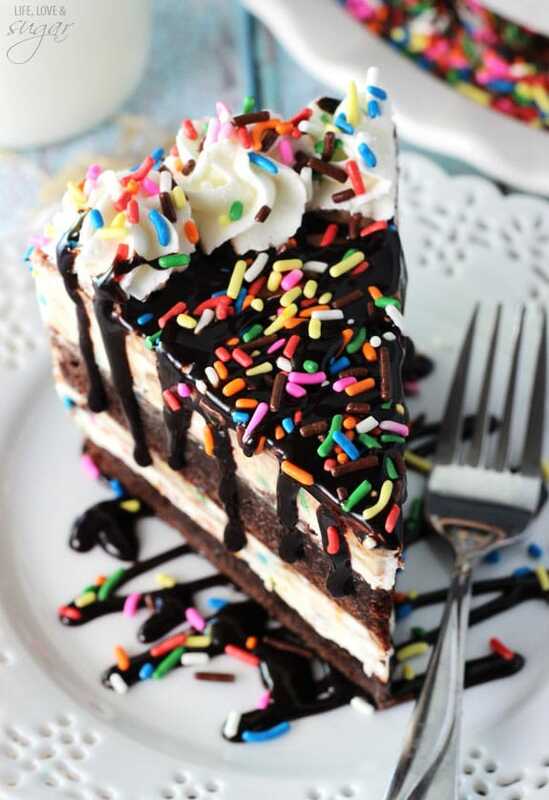 Drizzle with additional hot fudge sauce and top with whipped cream and sprinkles. Your ice cream cakes put Baskin Robbins to shame! This is gorgeous. Staining fences? No way, I’m with you, eating cake is way better. I do love is idea of how betting works though, that’s pretty good. Lindsay, as usual, you’ve outdone yourself with this one! This is so festive and pretty! I think I in a bet if your both wrong, no one gets a reward or prize. That’s great that you r fence is finally finished! And I totally agree with you about betting, if no one wins, how can you get a reward? 🙂 This cake looks so delish! All of my favorites combined into one. Yum! Yay! They finished the fence! This cake is the most gorgeous thing ever. My family would go crazy for it! This cake. There are NO words. You totally outdid yourself! Ice cream is my kryptonite, fudgy brownies are my vice, and topping it all off with hot fudge sauce… So dangerous. 😉 Pinned! For the record you are totally without a doubt correct on the betting rules! I hope he bet another one of these cakes because this looks to die for! Hope you have a fun trip! straight up swooning over here. That fence story is a trip girl. 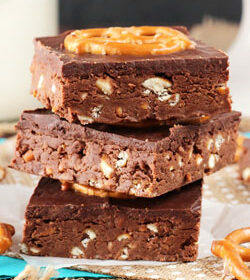 But this brownie situation is all I will be dreaming about until someone makes it for my bday! I love all your ice cream cakes. And this one sounds AMAZING. I mean cake batter and brownie? Yes yes please! Looks delicious!! I’m planning on making it for my sister for her birthday. Do you have an idea on how many it serves? Thank you!! 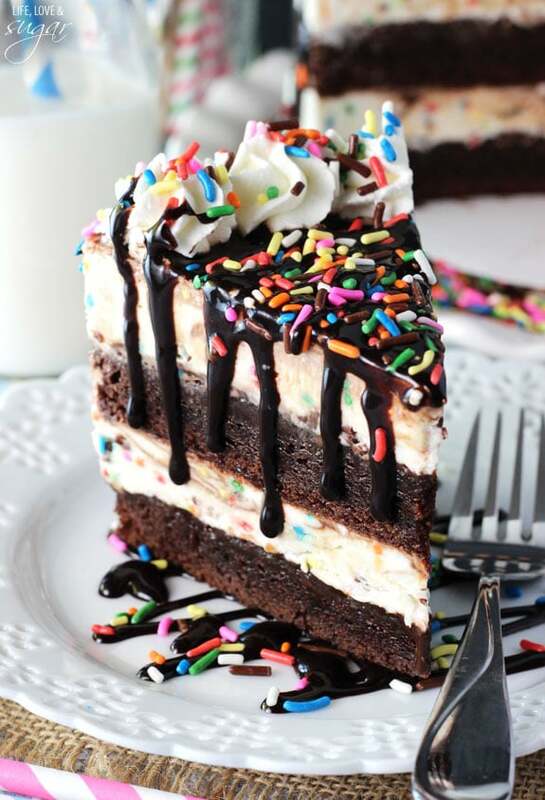 I am making this cake for my little sister for her birthday… I just wanted to be sure, the hot fudge sauce you are talking about, do you mean the kind that you buy in the jar and heat up before you use or the kind you buy in a plastic bottle and can just squeeze out? And if it is the jar I assume I am heating it before I put it in and on the cake? 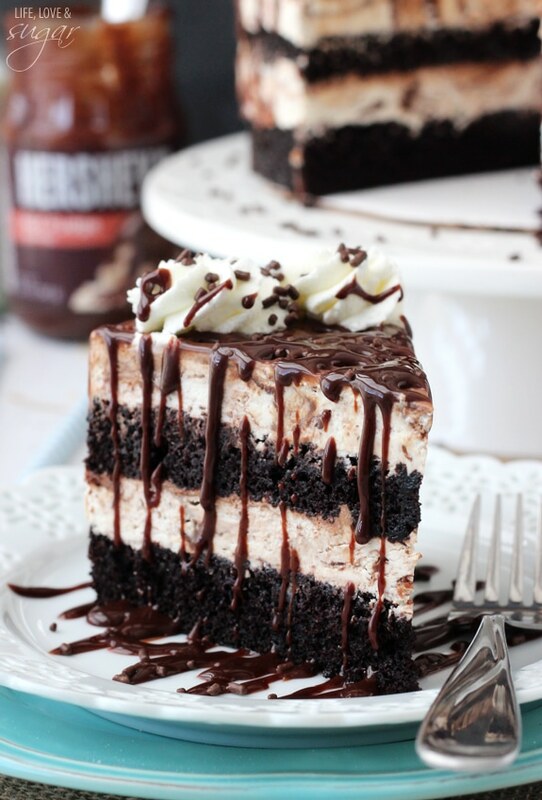 I used Hershey’s brand hot fudge sauce for this cake. It does come in a jar and should probably be warmed a bit before using. Hello! Can’t wait to make this cake. I only have 9 inch springform pans.. will this work the same? Yes, it should work the same, but it’ll be thinner layers. I’m wanting to make this for my son’s birthday tomorrow. I’m not the most experienced person in the kitchen. Could I use store bought ice cream? I would think you could, but you’d have to change up the method a bit. Melted ice cream is much thinner than the ice cream I use in the recipe. I want to make this cake for my husband’s birthday, was just curious how many days in advance I could make it? Because it’s frozen, it should be fine for several days. I’d say 2-3 days in advance at most is probably best though. 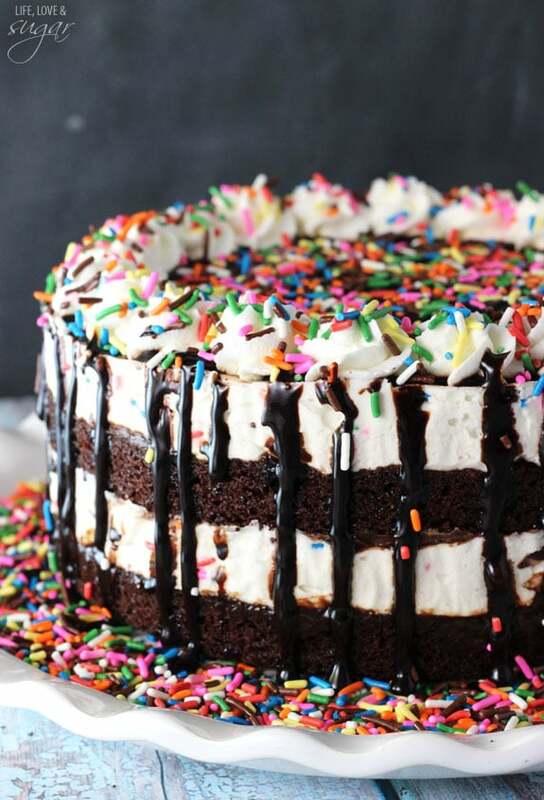 Hello There, just wondering if the brownie is frozen through when lifted out of the freezer and if so does this create an issue when trying to cut the cake? Yes, the brownie will be frozen. You can let the cake sit out for about 20 minutes before cutting and it should be fine. What is cool whip and fingertips cake mix ? Cool whip is a whipped cream replacement. Basically stabilized whipped cream. You could replace it with homemade stabilized whipped cream. 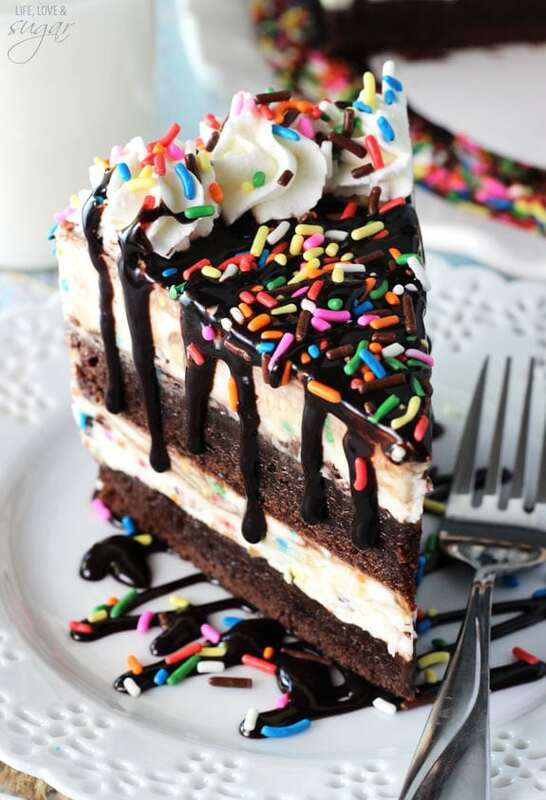 Funfetti cake mix is a sprinkle-filled vanilla cake mix. Hi! Do you think that a 12″ pan would work to double this recipe? Or do you think a 10″ pan would be better? Hmmm, I’m not entirely sure. Both might work, one would just be taller. 🙂 I might try the 10 inch. You could also do a 9×13 pan most likely. The brownie can be a little firm, but I usually let the cake sit for about 45 minutes or so before cutting and it’s fine. Thank you so much for your recipes! I made the, Cake Batter Fudge Brownie cake for my son’s birthday. We used the Pillsbury gluten free funfetti cake mix and it was a huge hit with everyone! Thank you again for helping us to make the occasion special. In the photos are the little swirls on top the leftover ice cream or something else? 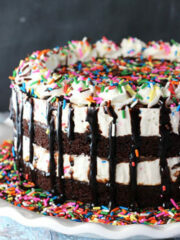 This cake looks delicious and I can’t wait to make it for my birthday on Saturday! They are whipped cream. I hope you enjoy the cake! Happy Birthday! Yum, and so many choices. I am done buying ice-cream cake! Thanks! Can I add the whipped cream decorations and then freeze or add that when I take out of the freezer? I’m making for my nephew’s birthday. Yes, you can add everything and then freeze it. Does this have a cream cheese taste? Would be for kiddo bday and she is not a fan of cream cheese. I personally do not think it does, but some people who seem sensitive to flavor have said they think it does. I recently stumbled upon your blog and I have to say it’s amazing. Thank you for sharing all these amazing recipes. 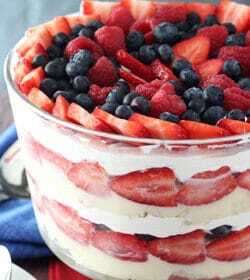 When I saw this recipe instantly I thought, “I have to make this for my sister’s b’day” coz it looks fantastic. Though I have a couple of questions about it. 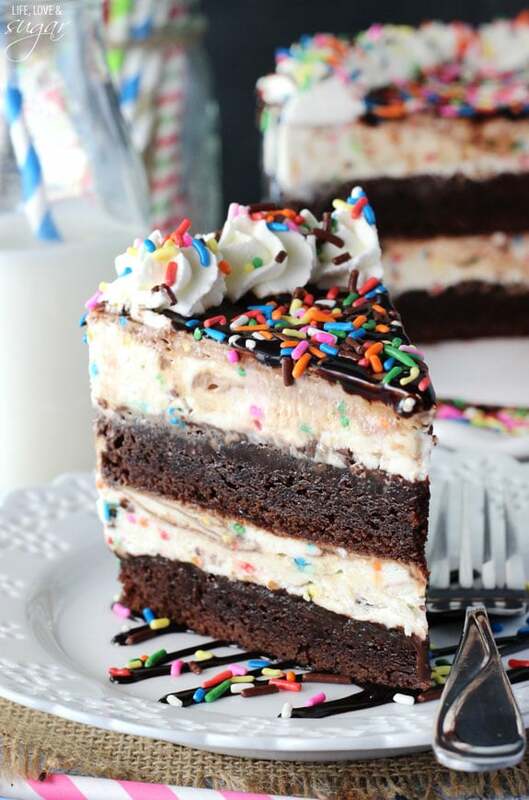 We don’t have the brownie mix or the funfetti mix in our country and I was wondering if I could use the brownie mix from one of your own recipes (www.lifeloveandsugar.com/2015/12/21/strawberry-brownie-cheesecake/) & the funfetti mix from your own vanilla cake mix (www.lifeloveandsugar.com/2017/02/24/homemade-vanilla-cake-mix/)? I’ll be really glad if you could help me out. Okay then I’ll let you know how it turns out. Thank you! Hi again! So I tried it with your vanilla cake mix & it turned out great. Everyone in my family loved it. Thank you so much Lindsay! ???? 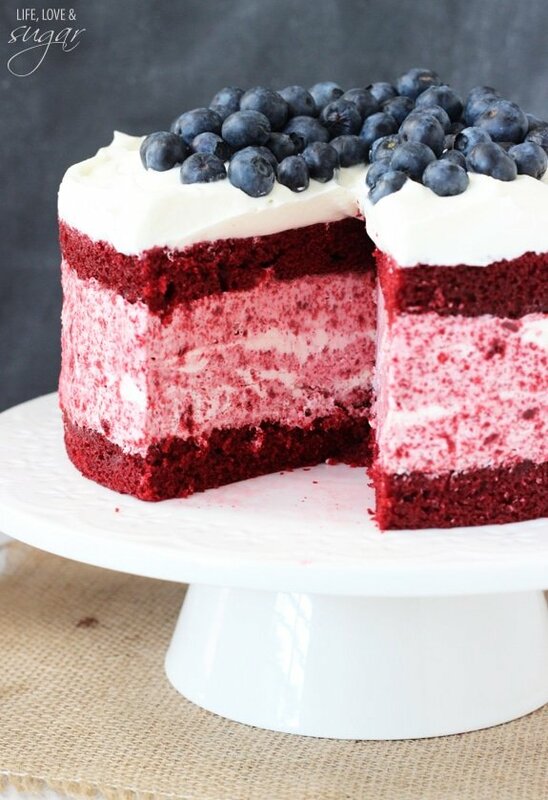 If I use this brownie recipe (www.lifeloveandsugar.com/2015/12/21/strawberry-brownie-cheesecake/) for the brownie layer, should I bake it for the usual 30-35 minutes in 350 degrees? The brownie from the cheesecake is made in a 9 inch pan. This cake uses 8 inch pans. If you are going to make one brownie in an 8 inch, you’d need to bake it for longer. If you split it into two pans, you’d bake it less. Probably closer to 20 minutes. Was wondering I have 10″ spring form pans. Should I double the recipe? I’m not sure…doubling might be too much. Maybe 1 1/2 recipes worth? I made this for my grandson, my question is, will it freeze solid? Mine is still soft and has been in the freezer for 5 hours. Yes, it should freeze completely. 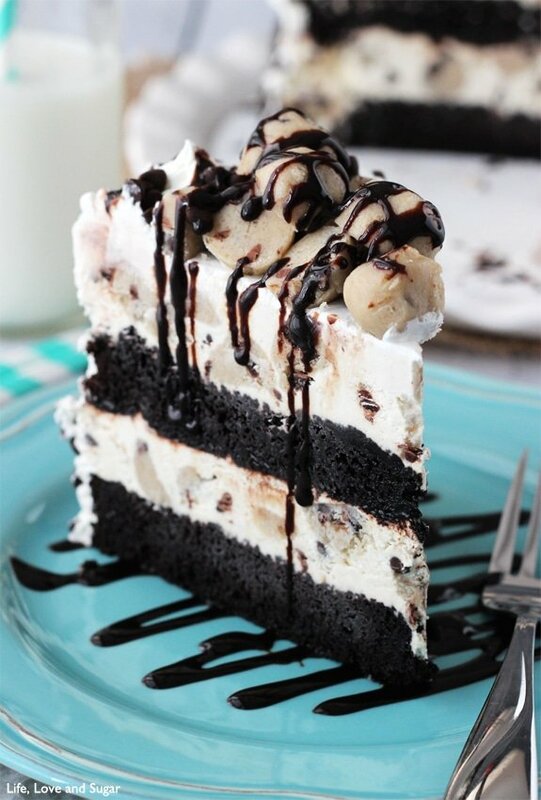 Our youngest was scrolling through Pinterest looking for ice cream cakes for her birthday. She picked this one, not realizing the connection to you until we were reading through the recipe. You entice us, even unexpectedly, Lindsay! ???? This cake looks awesome and I am going to attempt to make it but I have a question about the assembly. I am not understanding how I will be able to assemble the cake with all of the layers fitting in one 8″ pan. How deep should the pan be? I use an 8×3 inch cake pan and then the parchment paper that is used to line the sides of the pan extend the height a little more (photo). You could also use an actual cake collar (affiliate link). Thank you so much! I am going to give it a try! 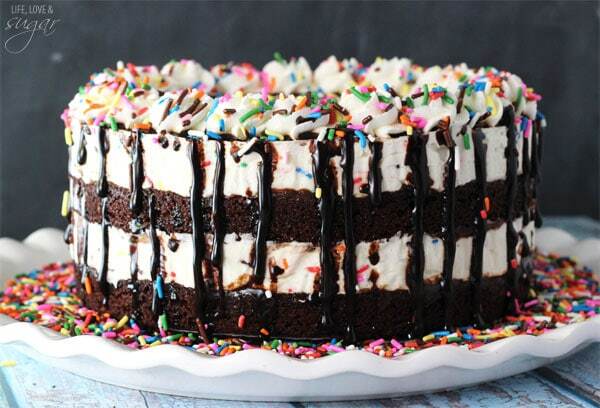 Could I adapt this recipe to a cake pan with only one layer of brownie and one layer of ice cream? I would think that’d be fine. You could cut it in half for an 8 inch round – or it might all fit well in a 9×13. I made this cake yesterday but i used baskin ribins vanilla icecream instead of making my own. I assembled the cake in way as mentioned but when i took it out and served it, brownie was hard as rock and difficult to cut and of course to eat. So we had to waited till the brownie got soften but by that the icecream was melted. Thats how its supposed to be? Yes, I could see that being an issue. The ice cream used in the recipe isn’t really a standard ice cream and doesn’t melt quite the same way, but gives the same flavor as ice cream. Because of that, you can let the cake soften a bit without the ice cream going everywhere. I’m sorry you had trouble with it! Hi! Wondering if you make the funfetti cake then put it in the ice cream or you use the dry mix in the ice cream? Thank you! Your pics are amazing! I felt like being extra lazy so I bought a container of vanilla ice cream, let it come to almost room temp and stirred in some sprinkles then lined 2 8 inch pans with parchment, filled it half way and then froze it. Absolutely delish! Thanks for the idea!